Heavily season both breasts with salt and place skin side down into a large frying pan, off the heat. Place pan over a medium heat and slowly render the duck skin. Leave in this position for approx. 8 minutes, until skin is dark brown and crispy. Flip breast onto flesh side and continue to cook for a further 3 minutes. Duck should have a nice bounce to it when pinched. Allow to rest for at least 5 minutes before carving. 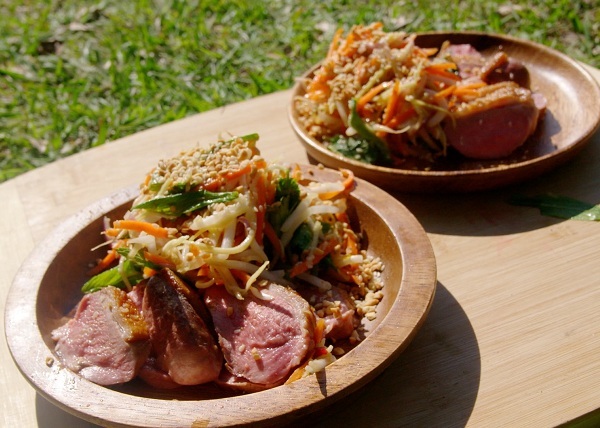 While duck is resting, combine mango, carrot, shallots, bean sprouts and herbs in a large bowl and toss to combine. Thinly slice duck breast and arrange on the plate, dress salad and place on the plate. Garnish dish with roasted peanuts and sesame seeds.